One of the cosmetic features introduced in Android Nougat is the ability to use different wallpaper for the home screen and the lock screen. Previously, the same image was used when the phone was locked and when you unlocked the phone. Now, you can assign different graphics as the background before the phone is locked and after you punch in that code to access your Android home. This isn’t a major groundbreaking feature that has been added but it still is nice to be able to set different wallpapers on different screens. Just an eye-candy for many but for those who’d prefer some distinction, you now have the choice. It seems to be a feature added in the Google Now Launcher. If you upgraded your Android Marshmallow to Nougat, then you will see the same graphic used in the backdrop. You will have to set a new one for the lock screen. Open a picture or graphic using your image browser, gallery or photo app. In Google Photos: Press the options button or the three horizontal dots. Tap on Use as and then on Wallpaper. After dragging and deciding on the position, tap on Set wallpaper. You will get to choose between “Home screen”, “Lock screen” and “Home screen and lock screen”. Choose the appropriate option as you see fit. 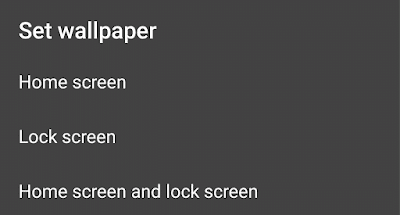 The setting to change the background is also available under Android Settings > Device > Display > Wallpaper > Google Now Launcher. Speaking of cosmetic changes, if you use Google Keyboard and are bored of the same white layout, you can now change the colors so that you can add a bit more flavor to the keyboard app. It now has themes. 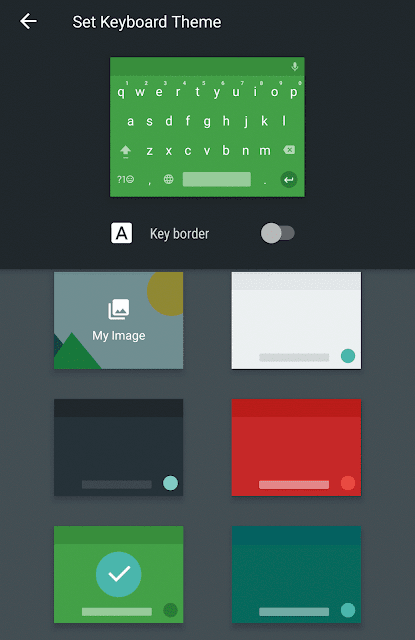 In the Set Keyboard Theme screen, you can choose among various colors to suit your needs. There’s also an option to use your own image as a background for the keyboard. You can also set key borders if you want.